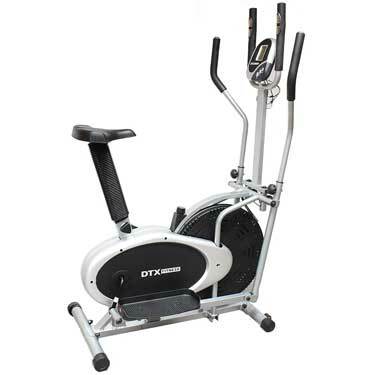 Extremely affordable and a 2-in-1 machine, the DTX Fitness offers both a cross trainer and exercise bike in one. This is perfect for anyone that likes to switch up their fitness routine, or users that can only stand for a short duration. Biking is also less taxing on the joints, which is an added bonus. A cross trainer and exercise bike are so well liked because they are considered low-impact. This means that there isn’t too much pressure put on the knees, ankles, hips and other vital joints. For those with injuries, people that are overweight or the elderly, these low-impact exercises are ideal. Safe and sturdy. This model is built with the user in mind. The flywheel is strategically placed on the front of the machine, adding extra stability for users. The unit simulates natural walking movements to ensure that the user does not overcompensate and cause injury or develop bad mobility habits. The large foot pedal can accommodate foot sizes as high as 12 (UK Size), while the seat is large and able to fit most users with ease. There is also an easy adjustment on the seat to move it up higher or lower. Moving stride bars can be used to further enhance the user’s workout and help tone arm muscles. There are also fixed bars for anyone that needs further stability or doesn’t want to work their arms during a workout. The fixed bars have built-in heart rate sensors that are highly accurate. There are mode settings available as well to track your workout. Anyone that wants to adjust the resistance of the machine will want to tighten the flywheel strap to make resistance more difficult. This isn’t the easy push-button resistance that most models have, but it is definitely better than not offering any form of resistance adjustment. My only real complaint with the DTX Fitness Pro 2 in 1, is that you have to adjust the resistance level by tightening the flywheel strap. This is not the easy, touch resistance adjustment that users love to see when they’re working out. But, this model comes at such a low price, tightening the flywheel strap is nearly justified. However if you are looking for a more advanced cross trainer then take a look at our best cross trainer page. For entry-level fitness enthusiasts or anyone that isn’t trying to gain muscle (with resistance), this is an affordable, 2-in-1 cross trainer and exercise bike. It even comes with a very accurate pulse sensor and calorie counter to let you track how effective your workout has been and how far you have biked during your session. With the added stride bars, this model is definitely worth buying.